This date, of course, is associated with bad luck and superstition, which is why it has its own phobia — "Frigg" was a Norse goddess who originally lent her name to the word that became "Friday," and "triskaidekaphobia" is the fear of the number 13. Statistically speaking, the day is not more dangerous than any other. But even people who don't avoid black cats or fear walking under ladders can have a little fun with Friday the 13th. Read on for some of the strangest, most tragic and simply notorious events that have occurred on Friday the 13ths throughout history. A child mill worker, Patch would get an adrenaline rush by leaping off of mill dams — a talent he eventually spun into public stunt shows for cash. The Niagara leap made him a national name. Less than a month later, however, Patch arrived in Rochester "half drunk," according to "Sam Patch, the Famous Jumper" (Hill and Wang, 2003) by Paul E. Johnson. Some 10,000 people gathered to watch Patch leap from Genesee Falls on Friday, Nov. 13, 1829. What happened next is lost to history, but an 1883 article in The New York Times reported that Patch "did not retain the position while descending or strike the water as he did on the former occasion," when he had previously made a similar jump. Whatever occurred, the Friday the 13th leap was Patch's last. On Jan. 13, 1939, a bushfire tore through Australia's Victoria province, killing 36 people in one day. This "Black Friday" fire was the deadly icing on top of a terrible fire season for the province. According to Australian Emergency Management, a total of 71 people died that January, and 75 percent of the state was affected by the flames. During World War II, Nazi Germany began an intensive bombing campaign against the United Kingdom, targeting London in particular. On 16 occasions, Buckingham Palace itself was hit, according to the City of Westminster Archives Centre. One of the most destructive of these hits occurred on a Friday the 13th. On Sept. 13, 1940, Queen Elizabeth and King George VI were at tea, according to the Archives. Five bombs struck the palace, one of which destroyed the interior of the Royal Chapel. Another ruptured a water main. Three people were injured, one fatally. Additional bombings would follow, but the palace survived the war with only slight damage. July 13, 1951, was an extremely inauspicious day for northeastern Kansas. The rains had been coming down hard and heavy since July 9, bringing up to 16 inches (40 centimeters) of precipitation to the Kansas, Neosho, Verdigris and Marais Des Cygnes rivers. On that Friday the 13th, records were broken. In Topeka, the Kansas River rose to 40.8 feet (12.4 meters), which was 14.8 feet (4.5 m) above flood stage and 6 feet (1.8 m) higher than any flood ever measured to that date, according to the National Weather Service (NWS). Topeka was swamped, as was Lawrence. In the Manhattan, Kansas, business district, the water stood at 8 feet (2.4 m) deep. It was the single worst day of flood destruction in the Midwest to that date, according to the NWS. Twenty-eight people died, and another 500,000 were displaced until the waters receded. The NWS and the U.S. Army Corps of Engineers estimate the damage amounted to $935 million at the time, which is equivalent to $6.4 billion in today's dollars. On Friday, June 13, 1952, the Cold War turned hot when the Soviet Union shot down a Swedish military transport plane. Eight people were on board the plane, which the Swedish government insisted was merely on a training flight. For its part, the Soviet Union declared it had no involvement in shooting down the lost DC-3. However, a life raft with shrapnel damage was found during the search for the wreckage, according to the Swedish Air Force Museum. And one of the rescue planes (a Catalina) was shot down by Soviet fighters mere days after the DC-3 disappeared. One of New York's most brutal and notorious murders occurred on Friday the 13th. On March 13, 1964, bar manager Kitty Genovese was stabbed and raped by a stranger, Winston Moseley. The attack took more than a half-hour, and an early New York Times article reported that 38 people witnessed the attack and failed to call the police. The tragic case became a staple in psychology classes as a way to illustrate the "bystander effect," or "Kitty Genovese syndrome," which occurs when people fail to act in a situation because they assume someone else will step in. The story appears to be more complicated, however; subsequent journalistic investigations revealed that this initial article inflated the number of witnesses and the number of attacks, and that it mistakenly claimed that Genovese was already dead by the time ambulances arrived. Several witnesses did see parts of the attack and turned away, but most saw only snippets and did not understand the gravity of the situation, or did intervene, albeit not quick enough to save Genovese's life. The deadliest tropical cyclone in history struck on Friday, Nov. 13, 1970, in Bangladesh. Making landfall that Thursday night, the Bhola cyclone killed at least 300,000 people, according to the University Corporation for Atmospheric Research. The storm was equivalent to a Category 3 hurricane, with sustained winds of 115 mph (185 km/h). Even more devastating was the storm surge. Funneled by the shallow geography of the Bay of Bengal, the ocean pushed onto land. According to a 1970 report from the National Oceanic and Atmospheric Administration, the surge pushed water up to 16 feet (5 m) high. With nowhere to evacuate to, people climbed trees to escape the rising waters; many were swept away. "The highest survival rate was that for adult males aged 15 to 49," researchers reported in a 1972 article in the journal The Lancet, "which is consistent with the impression that those too weak to cling to trees — the old, young, sick and malnourished, and females in general — were selectively lost in the storm." On Friday the 13th in October 1972, the Uruguayan Old Christians Club rugby team boarded a turboprop plane to travel to a match in Chile. They never made it. Because of a navigational error, the plane careened into an Andean mountain peak, crashing on a high-altitude snowfield. But the ordeal was only the beginning for 27 of the original 45 passengers who survived the crash and its immediate aftermath. Without cold-weather gear or much food, they were forced to improvise water-melting devices and eventually eat from the bodies of their lost companions — an ordeal memorialized in the 1974 book and 1993 movie "Alive." An avalanche killed eight more survivors at the end of October, and illness took the lives of others. Incredibly, rescue did not come until the end of December, after two survivors launched a death-defying effort to hike out of the rugged terrain for help. The last of the 16 survivors were rescued on Dec. 23, 1972, after 72 days in the frigid wilderness. According to a statistical analysis by the Aviation Safety Network (ASN), superstitious passengers need not worry about flying on Friday the 13th. The "unlucky" day is no more prone to plane crashes than any other. 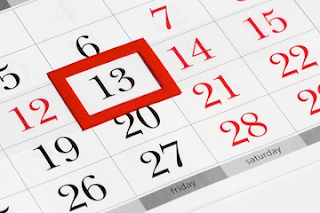 In fact, the overall rate of fatal crashes on Friday the 13th is lower than the average of all days. But Oct. 13, 1972, was not a great day to fly. The same day the turboprop plane carrying the rugby team went down in the Andes, a much larger flight crashed near Moscow's Sheremetyevo Airport in Russia, according to the ASN. The Ilyushin-62 airplane was carrying 164 passengers and 10 crewmembers from Paris to Moscow, with a stop in Leningrad. As the plane approached the airport, it flew into the ground at an air speed of 385 mph (620 km/h). Everyone on board was killed. According to the ASN, the cause of the accident was never determined. Mechanical malfunction is one possibility, or the pilot may have lost control due to a lightning strike. Friday, Sept. 13, 1996, was a tragic day for hip-hop, when rapper Tupac Shakur died of gunshot injuries in a Las Vegas hospital. Shakur had been injured on Sept. 7 in a still-unsolved drive-by shooting and died from those injuries on Friday the 13th. Alfred Hitchcock was born on Aug. 13, 1899 — a Sunday. That's two days off of perfect horror-movie-myth kismet, but never fear: The famous filmmaker would have turned 100 on Aug. 13, 1999, which was — you guessed it — a Friday. Hitchcock's work as a director was dark and often spooky, from the murderous "Psycho" to the creepy "Rear Window" and the obsessive "Vertigo." Residents of Buffalo, New York, have come to expect a lot of snow in the winter months. But 22 inches (56 cm) in the middle of October? That was the snowfall total recorded at the Buffalo airport on Oct. 13, 2006, during the "Friday the 13th" blizzard. (The towns of Depew and Alden, New York, got 24 inches, or 61 cm). The storm was so unprecedented that NOAA's history of the blizzard can barely contain itself: "Words cannot do justice to the astounding event which opened the 2006-2007 season," reads the agency's website. The snow that fell on Buffalo and upstate New York starting that Thursday afternoon and continuing into Friday was heavy and wet, and because the trees had not yet lost their leaves, branches snapped like matchsticks under the combined weight. Almost 1 million people lost power for up to a week because of the storm, according to NOAA. On Jan. 13, 2012, a peaceful Friday of cruising off the Tuscan coast turned chaotic as the Costa Concordia cruise ship struck a reef off the Isola del Giglio and began to tilt. At first, passengers were evacuated by lifeboat, according to the Associated Press, but as the ship came to rest on its side in the shallow water, survivors had to be airlifted to shore by helicopter. Thirty-two people died in the wreck. A massive salvage operation took 19 hours to raise the ship from the reef where it came to rest. The captain of the ship, Francesco Schettino, was arrested for multiple manslaughter and for abandoning the ship instead of directing the evacuation. Perhaps appropriately, the verdict in the case is expected this week, right around yet another Friday the 13th.